How can I reduce the cost of my quotation? Every quotation is unique and bespoke to you and therefore we encourage you first to speak to one of the team here so we can guide you through your quotation in detail. However here are some obvious things to consider depending on what product and material you have gone for. Like the uPVC Sash Windows we have an extensive portfolio of casements. The difference between the range however is less incremental and thus it is best to speak to the team about our alternative options. Furthermore, depending on your quotation we may be able to suggest some design or specification changes. Like the uPVC Casement Windows we suggest you talk to the team about designs and specification options. Species. The species of timber used in no way affects the guarantee of your products and therefore must be viewed as an aesthetic choice, so if you have opted for a painted Hardwood construction consider a Redwood or better still a Finger Jointed Redwood. Note, if you are planning on having a stained finish our hardwood options (Meranti & Oak) will take much better to the stain, in terms of colour, than Softwood. chosen a bespoke colour or colour match then this adds a small surcharge to the quotation. Dual colour (different colours inside and out) is our most expensive option and can add significantly to the cost of a quotation. 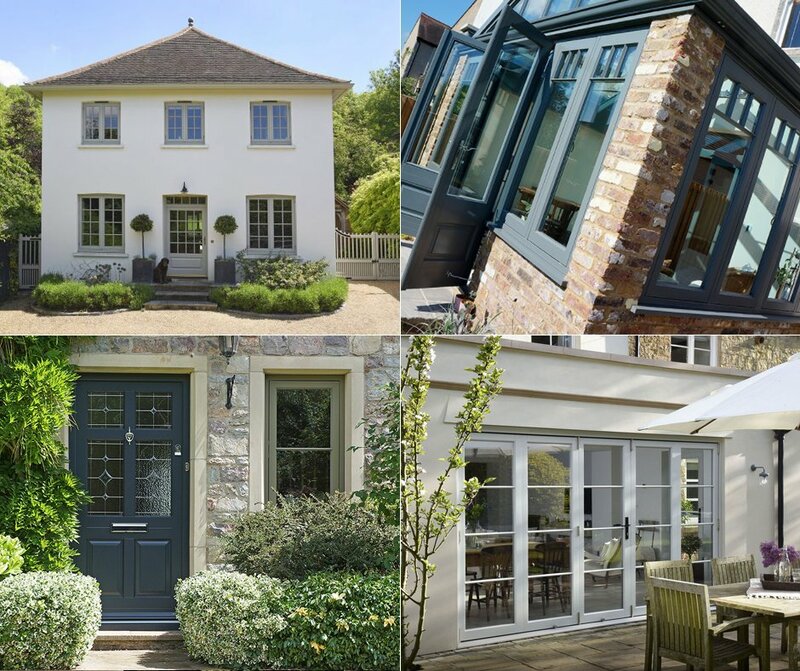 If you have chosen a particularly strong external colour consider opting for something more neutral which will complement both the inside and outside of your property. Furniture. Samuel Heath options form our premium range of furniture choices and they can soon add up. Our standard range have many comparable styles which are more affordable. Flush Casement pivot hinges. With our Flush Casements there are two hinge systems we can use. As standard we quote the friction hinge, however if you have opted for the pivot hinge then consider changing to the friction. Not only is this more cost effective but it also negates the need for a peg stay, especially important if you have chosen Samuel Heath furniture. Note that ‘Deco’ style windows can only be quoted using the pivot hinge. Sash mechanism. Our Sash Windows have two opening operations. By far the most popular, and unique to the timber sash, is the authentic lead weight and pulley system, available with either a cord or chain. However we can quote using a ‘Hidden Spring’ which is not only more cost effective, but is also the operation system used on all uPVC Sash Windows, thus giving a more comparable specification if you are comparing the two material finishes. As always we suggest speaking to a member of the team to see how we can help you with your quotation. What does my quotation include?/Are the any other costs I should consider and why are these not included? We aim to be as transparent as possible with all our costs, which is why we go through so much trouble to breakdown your quotation. Despite this, it is not feasible for us to provide a final price for everything at this stage of the process although we do detail explicitly in our quotation letters our list of exclusions. Architrave, waste disposal and scaffolding are the three key costs which should be considered but until we know the scope of any project and manufacturing sizes, we cannot realise them. This is one of the reasons we conduct a technical survey. As a guide, Architrave is £16.50+VAT/linear metre, an average builder’s skip costs £200+VAT (this will depend on a local supplier) and scaffolding is approximately £325+VAT for a single lift (again dependent on a local supplier). What is architrave and do I need it? Architrave is a decorative timber frame put around the inside of an aperture. Whilst predominantly found on sash windows, it its often also found around casements and doors depending on the age of a property. If you do not currently have architrave around your fenestration products then you do not require any on your new items. Can you keep and re-use my existing architrave? Unfortunately we cannot re-use your existing architrave. If you want to keep the same moulding as you currently have then we can match it, although this does come as an additional cost. Can I see the products which I have been quoted? 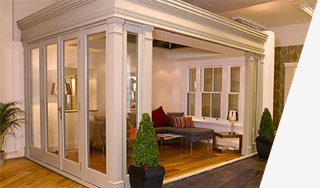 We have an exquisite showroom here in Leamington Spa which we highly recommend you visit as it includes an extensive collection of our product offerings. It is not always possible to show you exactly your product as the options and choices are almost limitless but you will get an incredibly strong idea. Furthermore we have a huge portfolio of work for you to view from the roadside. All quotes are valid for 60 days from the date of your quotation unless explicitly detailed otherwise. For fenestration products our payment terms are a 50% deposit, a 40% stage payment and a 10% final balance plus extras. For FSG and Plantation Shutters we require a 50% deposit with the balance due on completion. All of our products are bespoke and our lead time is dependent on your material choice, an indicative idea is provided on all quotations. All lead times are approximate and can change quickly. There are a number of factors that can influence lead times, including, but not limited to, factory capacity, stained glass and arched products. I would like to order, how do I go about doing this and what is the process? First of all a thank you from us! If you would like to place an order just contact the team here, either email the person whom sent you your quotation or call the office on 01926 278 800. Once you have given us the indication you would like to go ahead we will raise for you your Order Confirmation documents which include your deposit invoice, order confirmation letter, order FAQs, technical survey information letter and our terms & conditions. The terms & conditions require an electronic signature, once this is completed and the deposit is paid we will be in touch to organise a technical survey. If you are in receipt of this document you should already have received a thank you from us and your order confirmation documents. Once your deposit is paid and your terms & conditions signed we will be in touch with you to organise a technical survey. Within 10 working days of your survey we aim to have your Order Acknowledgement sent to you. This document requires you to sign and confirm your design and specification choices and return it to the office. From here your products will go in to production which is when your lead time will begin. As we progress through the manufacturing process we will be in touch to provide you a provisional installation date. What do you mean by lead time and when does it begin? Lead time is the time it takes for products to be manufactured and delivered to us. It begins from the moment we have processed your signed Order Acknowledgement. We aim to process Order Acknowledgements within 5 working days of receipt. It is important not to confuse lead time with the overall time of the process. The overall process time includes lead time, plus the order process and fitting schedule. There is no set timescale for the overall process as it is dictated by too many variables. We aim to move as quickly and as swiftly as possible and make your journey with us a smooth one. My Order Confirmation appears to be incorrect what should I do? Simply get in contact and tell us what is wrong. If we have accidentally issued an order confirmation for the wrong specification or items we will simply make the necessary amendments. I have paid my deposit and signed my terms & conditions but have yet to be offered a date for the survey? We aim to contact you within two working days from the receipt of your deposit and signed terms & conditions. If you have not yet received a call please get in touch with us on 01926 278 800. I have had my survey but not yet received my Order Acknowledgement? We aim to have your Order Acknowledgement sent out to you within 10 working days of the survey. On occasion this is not always possible, particularly in busy periods. Furthermore if you have bespoke products which require factory produced CAD drawings or replicated stained glass which require design drawings (again produced by the factory) please expect a slight delay. I have received my Order Acknowledgement but have some questions? Simply call the office on 01926 278 800 and one of the team should be able to help you. I want to change something on my order, how do I do this? On our Order Acknowledgement there should be a small box which allows you to write what changes you would like to make. This box is usually for minor amendments such as furniture options or finish. If you need to make wholesale changes please contact the office. We may need to send a revised version out to you for signature. I have already returned my Order Acknowledgement but need to change something? It is imperative you contact us immediately. Your order goes in to production soon after we have received your sign off. Once production has commenced it is unlikely that we can change anything. I have returned my Order Acknowledgement but have not heard anything since? You should have received a confirmation that we have received your Order Acknowledgement meaning your products are shortly to go in to production and your lead time has commenced. Whilst we are going through this stage there is no information we can give you until we receive an update from the factory on when they expect to deliver your products. Once we have received this information from them, we will be in touch to provide you with a provisional installation date. Whilst we understand that a period of silence can be unnerving, there really is no need to panic. You would have been issued with deposit protection insurance and we are simply waiting for items to be manufactured and delivered. Whilst we are a small business and hold exclusivity of our products for our region, our manufacturing partners are national companies and their capacity needs to be taken in to consideration. Why is my order taking so long? First of all we apologise for any delay, and hopefully we have kept you abreast of developments. It is rare that orders are delayed but it can occasionally happen. Please remember that we are a small business with limited resources in terms of staff and thus can be easily affected by illness and holiday. Furthermore our fitting schedule can also be hampered by adverse weather conditions and site delays. We do our best to negate these hurdles when they arise but unfortunately there is often only so much we can do. What is a ‘Provisional Installation Date’? Your provisional installation date is an indicative idea of when we will be able to install your products based upon the expected delivery date from our manufacturing partners and our current fitting schedule. It is not a confirmed date. Dates will be confirmed when we are confident that we will be able to honour them. I cannot make my offered installation date? Please contact the office on 01926 278 800 to let us know if you are unable to do the date we have offered and provide some guide as to when you will be available. We will then get back in touch with you with a revised date. When will I get a ‘Confirmed Installation Date’? You will receive your confirmed installation date as early as the stage payment request, if not a few weeks after. It is not an exact science confirming installations as there are so many factors beyond our control that can affect our schedule. We only provide confirmed dates once we are confident that we will be able to honour them. Still, in exceptionally rare cases, we may have to postpone your installation date if we have experienced severe unforeseen circumstances. This tends to only happen if the project immediately preceding yours encounters some form of delay, in which case, we will be in touch. I need to book/have booked other trades around the installation? We strongly recommend that you do not book in trades immediately before or after your installation, or based on any provisional dates which you may have received. We do not accept responsibility for delay to other trades. As a rule of thumb for any project, with ourselves or not, it is best to allow plenty of leeway in your schedule. This gives all trades the time to complete their work to the highest standard and provides you with a margin of safety. Booking in trades so close to each other means that any delay to one can result in a serious knock on effect to your project. What happens during the installation, is there anything I need to do? Your stage payment invoice will be accompanied by an ‘Installation Checklist’ which should detail all the information you need to know about your install. It is important that you read this and and do what is necessary. For example we ask for all valuables to be moved away from the window(s) being replaced with curtains, pelmets and any other window dressings also removed. We will not accept responsibility for any damage incurred by our fitting team if this has not been done. This is also one of the factors that can delay installs so we ask you kindly to be considerate. What happens after my installation? After your installation has been completed one of the team will call you to get your thoughts and feedback, plus discuss anything of note with you. We will also issue you with an invoice for your final balance. I have shutters on order to go in to my new windows, what is the process? Our surveyor will be booked in to come to your property on the final day of the installation or soon thereafter to take manufacturing sizes for your shutters. You will still receive your final balance invoice for the fenestration products as normal with the shutters treated as a separate order at this stage. We will then return to your property to fit your shutters and you will be issued with a final balance for those separately. I have an issue with my install/there are problems with the products? We hope that this is never the case, but despite the best will in the world, occasionally things go wrong. Please contact us immediately should you have any problems and we will discuss with you the best course of action. Can you paint my architrave? As stated in all our order documents we do not paint architrave, it is supplied and fitted in a raw state. My installation is complete is there anything I need to do with my new products? All of our products are installed in a pre-finished state, there is no additional decoration required, with the exception of architrave. If you have ordered an Origin Bi-folding Door from us will you need to activate the 20 year guarantee by registering your install with Origin. Details on how to do this should have already been given to you. I have a query with my final invoice? How do I maintain my products? Have you heard about our Care Plan? A unique initiative put forward by ourselves and the only one of its type that we know of, designed to put the responsibility of maintenance in to the hands of the professionals. For more information about how our Care Plan can work for you, visit timberwindowsleamington.com/more/care-plan/. Our products also come with a maintenance brochure directly from our manufacturing partners, detailing how to keep your products at their peak.